Getting Started in Zbrush is a very well done instructional guide for those looking to learn ZBrush for the first time. Author Greg Johnson has been teaching ZBrush classes for the last seven years and is really knowledgable about ZBrush, at least based on what I can see in the book. 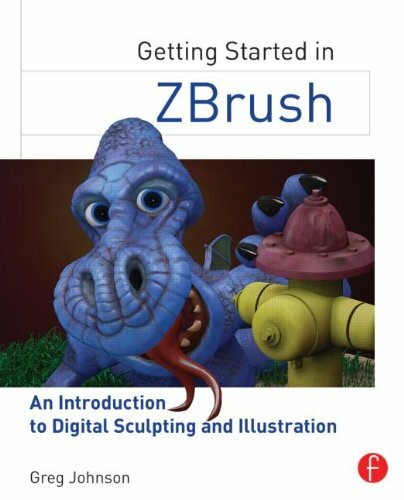 The book is basically one huge tutorial where you get to sculpt or model a dragon chilling out by a fire hydrant, the one you see on the cover. The tutorial is split into several chapters each talking about a specific step in the 3D sculpting workflow. Newcomers are warmed up by the introduction to the interface and basics, and then it quickly goes into the step-by-step tutorials. The instructions are written in a concise and easy to follow manner. Lots of big screenshots are provided, and on those screenshots there are labels that point out locations of buttons or menus you need, the areas of the dragon model that you need to work on. Every later chapter builds on the previous so you get to work on the dragon from start to finish. In general, you'll be learning basic sculpting to the extent of putting scales and wrinkles on the dragon. It also covers UVs and masking, colouring and texturing, lighting and rendering, and finally compositing. There are many smaller steps in between to refine the model, just to introduce different features of the software. Everything you need is in the book, and there are other resources listed where you can find references, textures and help. There's also a companion site with several hours of video demonstrations of selected tutorials. The companion website's link is on the back of the book so don't miss that. This is a fantastic book for ZBrush beginners. The straightforward hands-on approach will get you learning the ins and outs of sculpting with ZBrush in no time.